October may be one of the loveliest months to visit Montreal. The summer crowds have long gone, but there is still some bustle to the streets of Old Montreal before the severe winter cold hits. The autumn foliage is one of Canada's most beautiful natural attractions. Some of the best places around the city to see the colorful leaves include: Mount Royal Park, the Montreal Botanical Garden, the Morgan Arboretum, the 400-acre Bois-de-Liesse Park, Parc Jean-Drapeau, Bois de l'Île Bizard, and Parc Angrignon. Throughout the fall in Montreal, the weather is lovely—no longer hot and humid, yet not too cold. The average temperature in October is 48 degrees. The average high in October is 57 degrees, and the average low is 39 degrees. Visitors can expect rain about 10 out of 31 days in October. Meanwhile, Montreal weather in September is noticeably warmer (and the city is busier), whereas November is on the colder side with more snowfall. 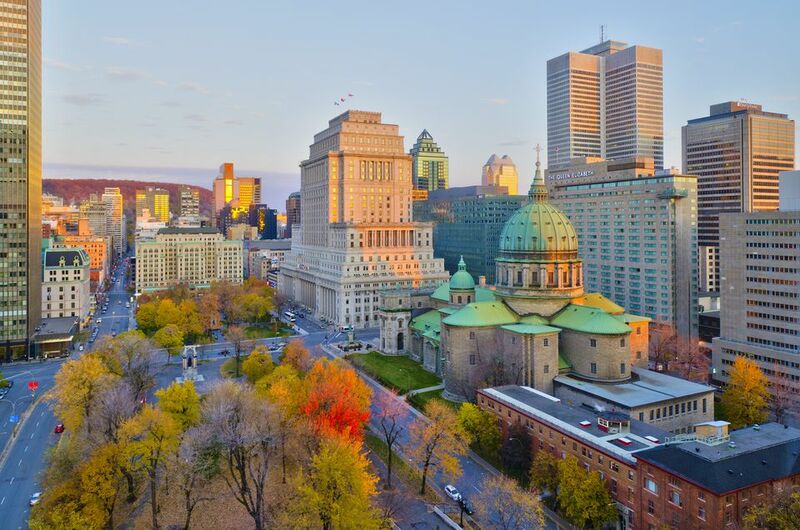 Travelers who plan to visit Montreal in October should be prepared for a variety of temperatures. Pack clothing that can be layered, such as long-sleeve shirts, sweaters, sweatshirts, jackets, and long pants. Evenings can get very chilly so be make sure to wear a heavy fleece or light down jacket over your outfit. You should also bring closed-toed shoes, sneakers or walking shoes, and boots for women. If the forecast predicts rain or snow, consider packing an umbrella, waterproof coat, warm hat, and gloves. There are endless things to do in Montreal year-round. The city hosts many festivals in October as well as concerts and museum exhibits. Save time to check out the Montreal International Black Film Festival, which brings audiences the lastest long and short-form films, while creating a space to debate major cultural, social, and socio-economic issues. The Magic of Lanterns in September and October highlights hundreds of handmade silk lanterns from China. Black & Blue is a massive party geared primarily towards an LGBTQ audience, but is non-discriminatory and is inclusive of everyone, straight and gay. Finally, the city's National Hockey League Team, the Montreal Canadiens, start their season at the end of September, and their games are open to the public. Before you jet off to Montreal, make sure to plan ahead in order to have a seamless trip. The second Monday of October is Thanksgiving in Canada, so banks and most stores will be closed, but you can expect crowds of locals and tourists that particular weekend. This slower October pace may be a good thing for tourists who don't mind the lull and can score some nice deals on flights and hotels during the fall shoulder season. Canada does celebrate Halloween—so pack a costume or shop for one in the city—and take part in activites, such as visiting a local farm for pumpkin picking or other spooky events like joining an urban Zombie walk.